As you receive a Gong harmonics activation, your body will allow the waves of vibration and energy to filter and open to a positive change. The vibrations help move blockages or stuck energy within the body, as the sounds flow throughout the Nervous System. 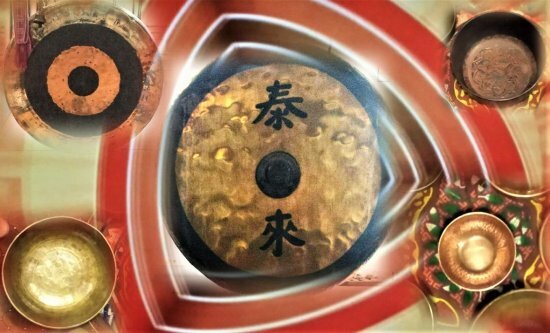 The Gong Harmonics bath rejuvenates the child like mind awakening the intuitive self lying in silence when the gongs stop experiencing the Oneness of Om. •Deep Relaxation•Release of Stress/Tension•Agent of Transformation•Clears the mind. Can I Become A Buddha? It was a beautiful and powerful performance. For at least 60 minutes, we were immersed in the sound waves of gong, singing bowls and other instruments. I felt the benefits of the vibrational healing throughout the performance. I felt much more relaxed, uplifted, and the pain from my physical injuries was much reduced too. I will definitely continue to attend. We recommend you bring water and wear comfortable clothing.